Deepavali or Diwali, is one of the most popular festivals of India and of Hindus. It is also one of the most eagerly awaited festivals in the Indian subcontinent. Business men and commercial establishments, consider it an opportunity to boost their sales and increase profits, while individuals use the occasion to celebrate life and strengthen relationships. For children it is a great opportunity to experience the joys of growing up and become acquainted with all types of firecrackers. It comes during autumn in the Hindu month of Ashwayuja, (also known as Ashwin or Aippasi), according to the lunar calendar and corresponds roughly with either October or November depending upon the movement of the sun and the moon and their relative positions in space and time. In Sanskrit, "Deepavali" means, a row of lights. Its origins are a mystery, steeped in the myths and legends of ancient India. It was said to be originally a harvest festival. It was meant either to celebrate the harvest or to commemorate the ancestors who departed to the ancestral world. Vedic people believed that upon death souls who were not destined for liberation ascended to the ancestral world which was located in the moon by the path of ancestors (pitrmarg). Since the path was not as bright as the sunlit path of the immortals (devayana) people might have held lights, lamps and torches towards the sky on that day in the hope that it would help them ascend to the ancestral world. References to the festival are found in the Padma and Skanda Puranas. According to the latter, the lamps that were lit on that day symbolized aspects of the Sun. Diwali is associated with several ancient legends, such as the ascent of Nachiketa to the heaven, the victory of Rama over Ravana and his return to Ayodhay to ascend the throne, the return of the Pandavas from exile, and the victory of Lord Krishna over the demon Narakasura. In Kerala people believe that on this occasion the demon king Bali who was granted salvation by Vishnu, visits the earth to see people celebrating the festival. People also believe that on this occasion goddess Lakshmi visits the homes of her devotees and blesses them. Hence, people try to keep their homes clean. Outside India community celebrations are a common feature. We have references, which suggest that celebrating Diwali in India has been a very ancient custom, which continues even today. A Sanskrit play, named Nagananda which was composed during the time of Harsha, states how it was celebrated with lamps, and how newly married couples received gifts on that occasion. Another scripture, Kavyamimansa, composed during the 9th century suggests how the homes were whitewashed and decorated with lamps. Al Beruni, the Persian historian who visited India in the 11th century mentions that Hindus celebrated Deepavali on New Moon day in the month of Kartika. 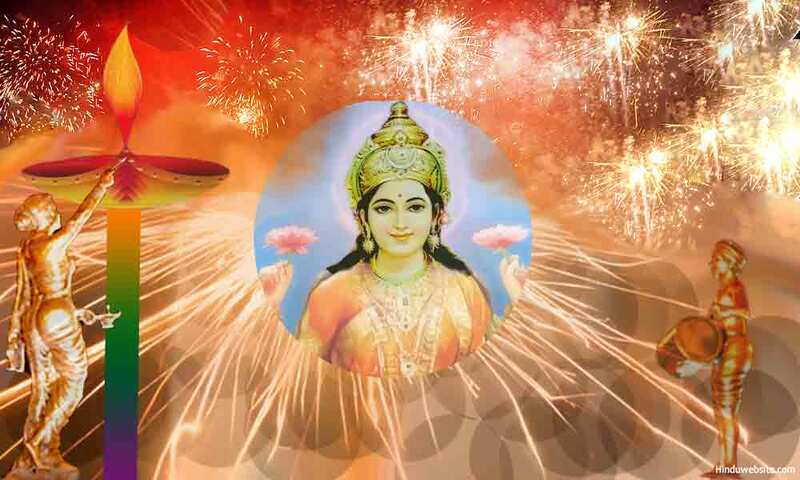 Diwali is celebrated not only in India but in all the countries such as Nepal, Sri Lanka, Mauritius, where Hindus are present. Whatever may be the practice, in a world ridden with the forces of ignorance, sorrow and conflict, we can feel its strong connection with the highest of our aspirations and deepest yearnings. In many ways, it is a ritual set in motion characterizing our natural inclination for things that are bright and beautiful, as expressed beautifully in the Vedic hymn, "tamasoma jyotirgamaya" (From darkness unto Light). Symbolically, it represents our divine nature and reminds us of our primary responsibility to pursue the path of light and attain liberation. While we do not clearly know the antecedents of this remarkably unique, Hindu festival, currently Maha Lakshmi, the goddess, who symbolizes all the positive forces of life and the divine aspect of wealth and abundance is revered as its principal deity and main object or veneration. Truly, the festival is a celebration of wealth and abundance in which people from all sections of society, both rich and poor participate. Goddess Maha Lakshmi is associated with a number of legends and divine entities. Just as she represents universal health, wealth, happiness, victory, courage, facility, fertility, harmony, beauty, joy and enlightenment, Diwali represents the brilliance and the abundance of life and happiness in its full glory. Many Hindus regard Diwali as the beginning of a new year. Historically, for traditional Hindu businesses it marks the beginning of a new accounting year. As the name suggests, Diwali is celebrated with lights and lamps, sounds, and joyous festivity. People consider the occasion an opportunity to start anew, to renew hopes, and to explore new relationships, possibilities and opportunities. The festival provides an opportunity to our senses to grasp their share of enjoyment and to our minds and hearts to experience the joys of life, belongingness, love, and universal brotherhood. As the festival approaches, memories of previous Diwalis fill the minds of people, as they await with eager expectations of yet another exciting and joyous occasion to celebrate life and kinship. When the day dawns and the night comes, the earth wears a glittering robe. You can see the homes and streets being lit up with the brilliance of lights and lamps, while flashes of light from the firecrackers fill the sky and the mid-region as if to express gratitude and invite the celestial beings of those planes to participate in the festivity and offer their blessings. On the night of Diwali, streets and public places all over India (and several other places) become filled with adults and children alike and reverberating sounds from the firecrackers. People from all backgrounds gather in streets, public places, lawns and front yards, house tops, or in front of their own houses to witness the celebration of joy and the victory of gods in the glow of auspicious lights. It is as if the mortal beings upon earth have discovered a way of lifting their minds to God to express their rejection of evil and their devotion and commitment to Dharma, righteous living, duty, morality, and all the good things that life and divinity represent. However, Diwali is not a mere festival of lights where wealth is worshipped and people congregate to indulge in vanity and ostentatiousness. Traditionally, the festival is a ritual worship of light and divinity to express the allegiance of human beings to gods rather than the demons. It involves a series of complex rituals for five continuous days by devotees to express their gratitude to gods for their services and in return discharge their obligations towards them through prayers and sacrificial offerings. The lights that are lit on the night of Diwali are part of those offerings only. Hence, the celebration of Diwali with lights and firecrackers constitutes divine worship only, in which discipline, faith and sincerity play an important role. The occasion offers innumerable opportunities to devout Hindus to focus their minds upon their gods and practice devotional service through karma yoga (the yoga of action) with detachment amidst distracting festivities and worldly activities. During Diwali time, people clean and decorate their homes and prepare for family gatherings. Nowadays the onset of Diwali season triggers a lot of buying activity, gambling and gift giving. Many projects are also started around this since Diwali is an auspicious festival. In the following paragraphs we will describe how Hindus celebrate Diwali during the five days, in addition to presenting a few interesting facts about the festival. In the end we will also focus upon the practice of burning firecrackers during Diwali and whether it is justified in today’s world. The first day of the festival is known as Dhanteras or Dhantrayodashi. Dhan means wealth, and Trayodashi means 13th day. Thus, as the name implies, this day falls on the 13th day of the first half of the lunar month. On this day, it is believed that, Lord Dhanwantari emerged from the waters of the ocean holding the knowledge of the spiritual medicines of Ayurveda, to help the mankind fight against sickness, disease and death. On this day people purchase valuables, light lamps using oil filled clay cups and worship the Goddess of Wealth. They also worship Yama, the Lord of Death, seeking protection against untimely death. Parents and elders accompany children to the market looking for firecrackers and sweets, if they have not purchased already. Those who have brought them home spread the crackers in the sunlight and allow them to dry, so that when the time comes they do not fail to perform. The second day of the festival is known as Naraka Chaturdasi. Narak means the purgatory or hell and Chaturdashi means the fourteenth day. Thus, this day falls on the 14th day of the first half of the lunar month. Religiously, the day marks the end of an evil empire in some prehistoric past and the beginning of a new era of Light and Knowledge. According to the legends, on this day Lord Sri Krishna, supported by his consort Satyabhama and his huge army, killed the demon Narkasura, in a legendary battle between the gods and demons and released the world from the darkness of fear and oppression. In the process, he also freed 16,000 divine Shaktis (energies) of the Mother Goddess, which were held forcibly until then by the evil demon. On this auspicious day, people usually take a ritual bath before sunrise, using traditional herbs and materials, just as Lord Krishna was believed to have done after He returned from the battlefields victoriously. They spend the remaining day restfully in the company of friends and family. Some play cards and test their luck. It is also believed that on this day Lord Vishnu incarnated upon earth as Vamana and put his foot on the head of the demon king Bali. With his foot he pushed Bali down into the nether world and freed the earth and the goddess Lakshmi from his control. The actual Diwali is celebrated on the third day of the festival, when the moon completely wanes and total darkness sets in the night sky. It is in this darkness that Diwali finds its true expression. 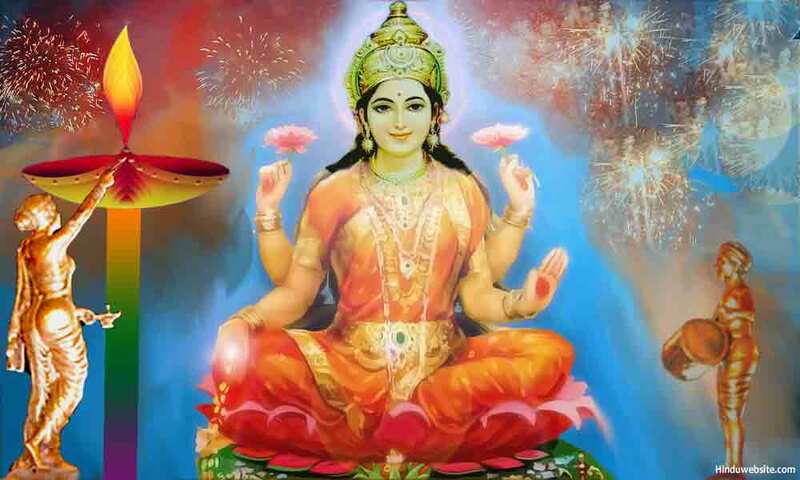 On this day people worship Lakshmi, the goddess of wealth and express their gratitude for previous favors. Usually, the pooja is performed both in the morning and again in the evening when the sun is ready to set or has already set. People believe that the Goddess will not visit those homes which are not kept clean or properly lighted. So everyone strives to keep their houses clean, the doors and windows open and all the lights and lamps glowing brightly. During the worship, devotees make offerings to Lord Vinayaka and Mother Goddess also, in addition to the principal deity, with traditional chants, rituals, purified water, new clothes, fruit and flowers, sweets, light, sandal paste, incense, rice, turmeric and vermillion. Money and valuables are placed before the principal deity during the invocation. At the end of the worship, prasadam is offered to the family members and visitors. In wealthy households, the assistance of a temple priest is sought to conduct the worship according to the scriptural injunctions. After worshipping the goddess in one's own house, people start making rounds to the nearby temples, and the houses of friends and relations to see how the celebration has been going on and distribute sweets and gifts. Elsewhere, the goddess is worshipped ceremonially in temples, public places, business houses and offices. As the evening comes, houses and streets are decorated with innumerable lights, lamps and candles. People keep the doors and windows open and all the lights on, expecting the goddess to come inside and take a survey of the things that have been done for her sake. Outside, people gather in the streets and front yards to burn firecrackers, or watch others burning them or keep an eye on the oil lamps. Some habitual card players, use the occasion as an opportunity to play cards and gamble their money. According to a legend, on this day Lord Krishna completed his incarnation upon earth and left this world, leaving the pandavas and his kinsmen in utter confusion. In Jain tradition it is believed that Lord Mahavira, the last of the Thirthakaras, attained Nirvana on this day only. According to another prevailing legend, it was on this day, young Nachiketa of the Kathopanishad, received divine and secret knowledge of immortality from Lord Yama, the Lord of Death. The fourth day is variously known as Padwa, Varshapratipada and Kartika Shudda Padyami. According to a legend, at the behest of Lord Krishna the people of Braj worshipped the hillock Govardhan on this day to save themselves from an impending storm unleashed by the fury of Indra, the Lord of Heaven. Even now, in northern India, in the land of Braj, people continue the tradition of worshipping Govardhan on this auspicious day. In a sense, this is an act of invocation to appease the forces of Nature to prevent the occurrence of floods and cyclonic storms, a tradition that is probably rooted in the Vedic times. In the temples of Mathura and Nathdwara priests give a special bath to the principal deities on this occasion and decorate them with glittering robes and eye catching jewelry. They heap a mountain load of food infront of the deities in a symbolic way and later distribute it to the devotees as prasadam. In traditional households, women worship their husbands and receive gifts and blessings in return. Business people open new account books to begin the new financial year and offer prayers for luck and prosperity. The fifth and final day of the festival is known as Bhai duj (Bhayiduj, Bhayyaduj, Bhavbij or Bhayitika). On this day brothers and sisters get together to strengthen their bonds of love and affection and celebrate the occasion. Sisters put a ceremonial mark, usually with vermilion, on their brothers' foreheads and wish them long lives. According to a legend, the tradition began when Yamuna, the sister of Lord Yama honored her brother with a tilak on his forehead and wished him long life. 1. It is believed that the festival of Diwali commemorates the return of Lord Rama to Ayodhya. After spending 14 years in the forest of Dandaka and slaying the demon king Ravana, when Rama returned to Ayodhya, his capital city, people were overjoyed by the news of his arrival and started the tradition of Diwali by celebrating the day with lights and lamps. However, it must be noted that although the tradition links Rama to the festival, the Ramayana does not mention it by name. We do not find any reference to it in the Ramacharitmanas of Tulasidas. 2. It is suggested by some historians that the tradition of Diwali could be traced to the Harvest festivals of ancient times when people observed the end of a harvest season with some kind of festivity to celebrate the occasion. Since Diwali usually comes at the end of the harvest season, it lends credence to this theory, although we do not have any historical or scriptural evidence to prove it. 3.Two eminent Hindus, Swami Dayananda Saraswati and Swami Ramathirtha, left their mortal bodies on this auspicious day. 4. In West Bengal, people worship Goddess Durga during the Diwali festival. According to a legend, Durga killed Mahishasura in a fierce battle and continued her victory dance even after the demon was slain. 1. Not only Hindus, but Sikhs also celebrate Diwali as an important festival. It is said that the foundation stone for the Golden Temple was laid during the time of Diwali in 1577. 2. Diwali played an important role in the life of Sri Guru Hargobind Ji, the sixth Guru of the Sikhs. When Jehangir, the Mughal emperor, arrested Guru Hargobind and put him in a prison in Gwalior, gloom descended upon Sikhs. However, Jehangir relented and freed the Guru. Accompanied by his followers and to the joy of many Sikhs, the Guru returned to Amritsar and made an appearance before his followers. The occasion was Diwali and it prompted the followers to celebrate the day with joy and happiness. 1. It is said that the first scriptural reference to Diwali is found in the Jain scripture Harivamsha Purana, by Acharya Jinasena. None of the principal Hindu scriptures mention the festival in particular. It prompted some to conclude that Diwali was originally a Jain festival and later adopted by Hindus as a festival of their own. 2. Lord Mahavira, the last of the Jain Thirthankaras, said to have attained Nirvana on this day at Pavapuri. Accoriding Jain legends the first disciple of Mahavira, Ganadhar Gautam Swami also attained complete knowledge on this very day, thus making Diwali a special occasion for Jains to celebrate. 3. The way Jains celebrate Diwali is different in many respects. There is an element of asceticism in whatever Jains do, and the celebration of Diwali is not an exception. The Jains celebrate Diwali during the month of Kartik for three days. During this period, devoted Jains observe fasting and chant the Uttaradhyayan Sutra which contains the final pravachans of Lord Mahavira and meditate upon him. 1. Diwali is celebrated in various parts of the world, in countries such as Britain, Guyana, Fiji, Japan, Indonesia, Malaysia, Mauritius, Myanmar, Nepal, Singapore, Srilanka, Trinidad and Tobago, Thailand, Africa, and Australia. With more and more Indians now migrating to various parts of the world, the number of countries where Diwali is celebrated has been gradually increasing. In most of these countries Diwali is celebrated on the same lines as described in this article with some minor variations. Some important variations are worth mentioning. 2. In Malaysia, people call Diwali as Hari Diwali and celebrate it during the seventh month of the Hindu solar calendar. In many respects it resembles the traditions followed in the Indian subcontinent. 3. Diwali is celebrated in Nepal with a lot of fanfare as in India, during the period of October and November, where it is known as Tihar. Here though the festival is celebrated for five days, the traditions vary from those followed in India. In Nepal animals are worshipped during the first two days. On the first day cows are worshipped and given offerings. On the second day, dogs are revered and offered special food. During third day the celebrations follow the same pattern as in India, with lights and lamps and lot of social activity. On the fourth day Yama, the Lord of Death is worshipped and appeased since on this occasion he said to have spared some legendary people from a certain death. On the fifth and final day, brothers and sisters meet and exchange pleasantries. 4. Diwali is celebrated in the Caribbean Islands also. Especially in Trinidad and Tobago Diwali it is marked as a special occasion and celebrated with a lot of fanfare. It is observed as a national holiday in this part of the world and some Ministers of the Government also take part in the celebrations publicly. 5. Diwali is celebrated by Hindus in the USA at homes, temples, and community halls. However due to restrictions in various states on the use of firecrackers, Hindus are presently not using firecrackers during Diwali. Many hesitate even to light lamps, or celebrate the festival in open, since it attracts attention and complaints from the neighbors who do not know what the occasion means. It is time Hindu associations in the USA to take up the matter with the State and Federal authorities and obtain permission to celebrate Diwali with firecrackers just as people have the permission to celebrate the Fourth of July. A growing number of scholars and people question the need and justification of using firecrackers to celebrate Diwali and demand for its discontinuation citing several reasons which are stated below. Every year a lot of money goes into flames in the name of celebrations towards firecrackers. It serves no purpose except a little excitement and could be used by people for more productive purposes or humanitarian aid. Many companies that are engaged in the manufacture of firecrackers employ child labor. They hardly follow the safety rules or regulations. Because of negligence and lack of oversight, occasionally it leads to fire accidents and deaths. The manufactures do not maintain quality due to slack regulations and corruption. When people use them, they expose themselves to the hazard of injuries and accidental deaths. Miscreants use the opportunity to use firecrackers and create in streets and public places or tease women. Many fire accidents also happen in areas where people live in houses with thatched roofs and temporary constructions. Excessive and unchecked use of firecrackers is a source of public nuisance and often leads to communal clashes, street fights, and social tensions. The festival brings out into open the social and economic disparities that prevail in society. While rich families celebrate the festival with great abandon, poor people and children experience despair and frustration when they see others celebrating. The firecrackers used during the festival on a large scale are a source of pollution. However, on the positive side it is said that the smoke and smell coming from them drive away insects and mosquitoes and keep people safe from their bite. Some of the points mentioned above are valid and justified. Hence, some introspection may be required. If we can separate emotion and belief for a moment and examine the issue with reason, it makes sense for each family to minimize the expenditure on firecrackers, at least by avoiding the purchase of certain types which are expensive and hazardous, or which create noise pollution. Instead, they can spend that money for a good cause such as giving charity to a temple, organization, or a needy person. They can still celebrate Diwali with lamps, and other festivities. Diwali symbolizes the triumph of light over darkness, and of good over evil. We celebrate light because it represents life. Apart from the traditional methods of celebrating it, you can celebrate it in other ways too such as lighting the lamp of knowledge in the minds of others or bringing hope and happiness in their lives through selfless service. Goddess Lakshmi will be truly pleased if you become a lamp to others and channel her light, wealth, and abundance to them. Let you be a lamp in the darkness of ignorance and suffering and spread light in the lives of others. It is better than living selfishly and accumulate karmic darkness. Wealth is truly divine. It remains divine and force of light only when it is spent for good causes and with right intentions to promote harmony, happiness, and spiritual wellbeing. Those who know the Maha Lakshmi know how she is pleased when wealth is spent for the purpose for which it is intended, which is the performance of obligatory duties for the preservation of life, order and regularity upon earth In today’s world, let us therefore celebrate Diwali as an auspicious occasion and a sacred opportunity to bring cheer and happiness in a world which is oppressed by the darkness of egoism, greed, vanity and selfishness.